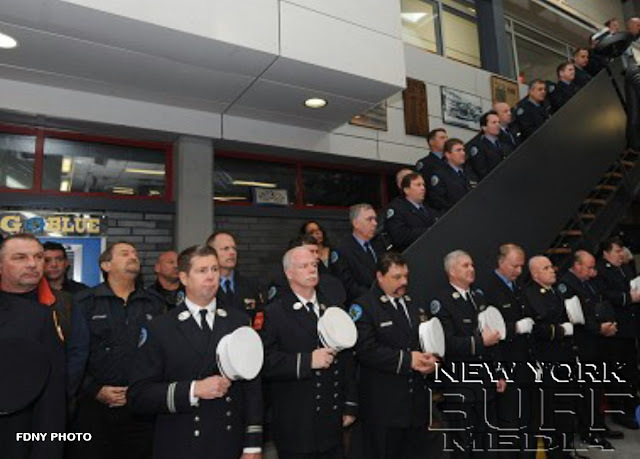 One year after his tragic death, firefighters, family and friends gathered at the quarters of Rescue 3 in the Bronx to remember Lt. Joseph DiBernardo. Lt. DiBernardo suffered critical injuries on Jan. 23, 2005, when he and five other firefighters were forced to jump from a fourth floor window after being trapped by fire. Lt. Curtis Meyran and Lt. John Bellew died that day from their injuries. The hero endured multiple surgical procedures, years of medical treatments and physical therapy due to his injuries. He retired from the FDNY in January 2006. At the time of his death was taking numerous pain medications, which the Suffolk County Medical Examiner cited as determinate in his accidental death on Nov. 22, 2011. “He inspired all of us with his enthusiasm and commitment to firefighting,” Chief of Department Edward Kilduff said. Lt. DiBernardo was appointed to the FDNY on Oct. 15, 1995, after first working for the Department as a Fire Alarm Dispatcher in the Bronx Communications Office. In his 16 years as a New York City Firefighter, Lt. DiBernardo was assigned to Ladder 56 in the Bronx, Engine 47 in Manhattan, Engine 238 in Brooklyn, and Squad 61 and Rescue 3 in the Bronx. In addition, he taught rescue training at the FDNY Technical Rescue School. Lt. DiBernardo also served as a volunteer Firefighter in the Setauket Fire Department in Suffolk County, NY. Retired Firefighter Jeff Cool, Rescue 3, who was among the six firefighters forced to jump from the Bronx fourth floor window in 2005, described Lt. DiBernardo as an incredible firefighter with an incredible memory. “Every time I worked with him I learned something new,” he said. He also described the experience at the Bronx fire. He said and then-Firefighter DiBernardo stood at different windows, the fire blowing out over their heads. Firefighter Cool had a safety rope, and said he would lower Lt. DiBernardo with it. Lt. DiBernardo refused, saying he would lower Firefighter Cool because he had a wife and kids. After lowering Firefighter Cool as far as he could, Lt. DiBernardo tied himself to the rope, which broke after he lowered himself just a few feet. 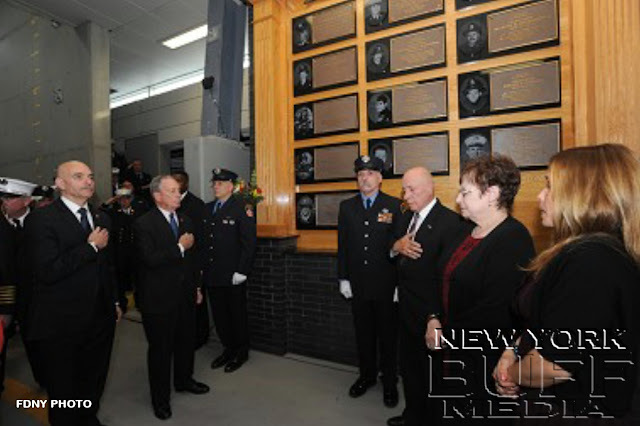 Lt. DiBernardo is survived by his father, retired FDNY Deputy Chief Joseph G. DiBernardo, and his mother, Barbara.